For the last two days I’ve probably sounded like someone who’s been studying the writings of Masters and Johnson. (“Have you heard of the Colbert Bump? How about the Lepucki Lift?”). 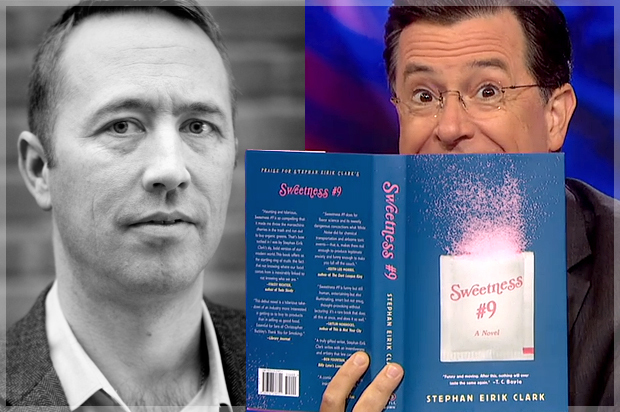 It’s been great, and I thought it important to express, in something more permanent than a Tweet or a status update or even a recurring thought, how grateful I am for everything’s that’s happened — and is happening — to my debut novel Sweetness #9. Writing any book requires an act of faith, and that goes double for a book that takes something like thirteen years to finish (raises hand, nods head, looks down at feet). Along the way, you pepper yourself with questions. Will I ever finish it? Will it be any good? Will a publisher buy it? Will any readers find it? But even if you do persevere, you never expect to have your book discussed on TV before it’s even in stores. So yes, to have so much attention splashed my way is simply beyond my wildest expectations, and for that I am extremely grateful to Stephen Colbert, the very literate Colbert Nation, any readers who stumbled into my book because of the recent news coverage (here, here, here, and here), Sherman Alexie (for getting this all started), and Edan Lepucki — Californian, book lover, patriot — without whom none of this would be happening. Thank you! This entry was posted in Colbert, Colbert Nation, Lepucki, Sweetness #9. Bookmark the permalink.